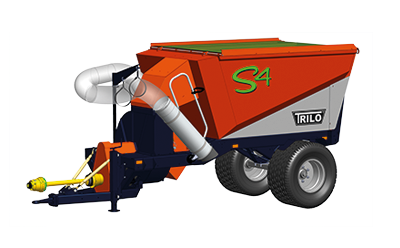 Compact vacuum sweepers with a loading volume of 4 m3. Vacuum sweepers equipped with a wander hose are ideally suited for mobile removal of materials from hard-to-reach places. For example, you can effortlessly vacuum up scarified material and grass clippings but also leaves or even litter. The compact vacuum sweepers are equipped with a 6 metres long flexible suction hose with a diameter of 250 mm. The end piece is equipped with a comfortable hand grip, a gauge wheel and a rubber end piece that allows large of material to be collected quickly and effectively. The fan is mounted in a housing with a replaceable lining and is driven by a PTO drive shaft attached to the tractor and requires an output of The required hp PTO can vary depending on the working conditions.45 – 70 HP (33 – 51 kW). • Vacuums up both litter and grass clippings.